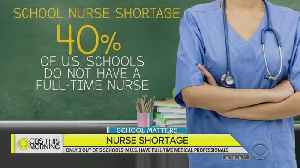 One News Page United States > News Videos > Is there a shortage in school nurses? Is there a shortage in school nurses? Super important for someone who is allergic to peanuts and had an allergic reaction at school." School nurses are an important part of a healthy school system..
Across the country...there's a major shortage. 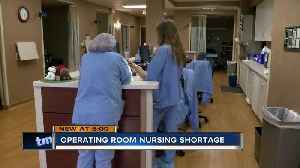 Only three out of five schools have full-time nurses on their staff..
Schools in the wabash valley are feeling that shortfall as well... news 10's sarah lehman is live on indiana state university's campus. 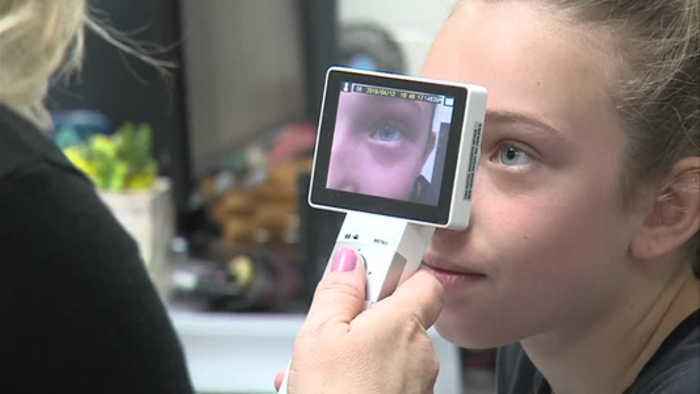 She spoke with nursing students and vigo county school leaders about the growing issue... in tonights top story... sarah tells us why not enough trained people are filing the roles..
Patrece...rondrell... it's a crisis that could be putting many kids lives at risk. That's why one nursing major here at indiana state university says she could consider doing it later in life. &lt; it's being called a national called a national epidemic... "often can't afford to employ a school nurse or if they employ a school nurse those nurses are covering multiple schools." More and more schools across the country don't have a full time school nurse. For kids with chronic illnesses or disabilities... having no school nurse... could be life threatening. "we'd like to have more nurses...we'd love to have more nurses. That comes at a financial cost." Elizabeth oswalt is a nursing major at indiana state. She says not having a school nurse growing up is what spiked her interest in the feild. "i didn't have a school nurse well at least she wasn't like a registered nurse. She was someone that put bandaids on you but i didn't have that at my grade school so it would be interesting to see that side of nursing." Oswalt says she did consider working as a school nurse because she enjoys working with kids. Instead shes taking a job after graduation in a hospital. But she isn't ruling the option out. "my goal is to sooner or later move out of the hospital into a more community based setting but idk i could be pulled somewhere else but school nursing is something i'm interesed in." > now, specifically at vigo county they told me that each school has a trained health assistant..
That person is kind of the middle ground in between a registered nurse and a teacher. Reporting live at indiana state university sarah lehman news 10 back to you. There are no federal laws regulating school nurse staffing. But it's recommended that one registered nurse be in "every" school. There is a push to get a nurse into every school in the U.S. The operating room can be one of the scariest places in a person's life, and there are not enough nurses to help patients through.